When a surgical wound heals properly, the sutures around its edges stay intact while new tissue, known as “granulation tissue,” starts forming. 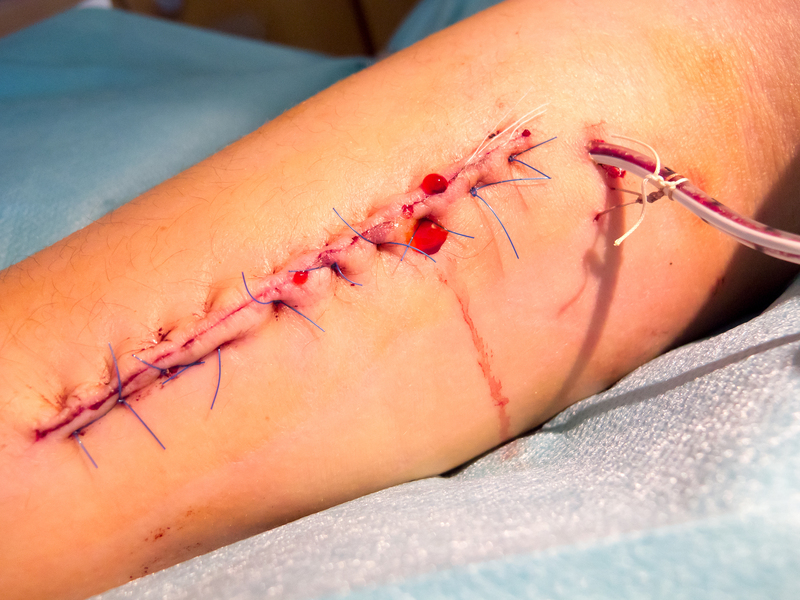 One of the most common complications of surgical wounds is when the surgical incision breaks along the suture. In other words, the wound splits open, a condition known as wound dehiscence. Why does wound dehiscence occur? Wound dehiscence is caused by many things such as age, diabetes, infection, obesity, smoking, and inadequate nutrition. Activities like straining, lifting, laughing, coughing, and sneezing can create increased pressure to wounds, causing them to split. Chronic use of corticosteroids (steroid hormones made in the adrenal cortex or synthetically), previous scarring, the presence of radiation at the incision site, improper stitch usage, unsuitable suture type, fluid-coagulant balance, cancer, and surgical errors can also contribute to wound dehiscence. 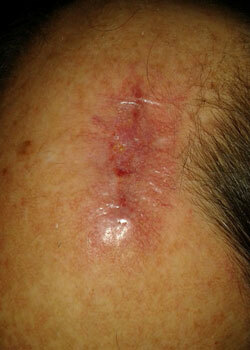 Dehiscence can also occur due to poor wound undermining throughout the surgery. Wound undermining means that damaged tissue extends under the skin and can’t be seen on the surface. The location of the wound can also cause dehiscence. For example, wounds located on the legs, shoulders or back, or in mobile areas or areas prone to high tension, are at increased risk of rupturing. Patients diagnosed with Ehlers-Danlos syndrome are more likely to experience dehiscence. Ehlers-Danlos syndrome is an inherited disorder that affects connective tissue, particularly skin, joints and blood vessel walls. Broken sutures that don’t heal. Bleeding from wound and bleeds at the surgical wound entry points. Pain at the wound site with high sensitivity to touch. Sudden opening of the wound. Wound drainage – pus-filled and frothy. A frequent effect of wound dehiscence is arterial bleeding. Blood from an arterial bleed is brighter in color and may spurt, or pulsate. Arterial bleeds occur more often in patients who are overweight or suffering from diabetes. 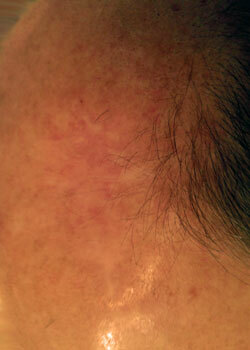 Abscess – swollen area that contains pus. Erythema – abnormal redness of the skin. Large amounts of exudates – seepage from the wound area. How is wound dehiscence treated? Dehisced wounds require immediate attention. After the wound is sutured closed, doctors primarily use one of two methods to treat dehiscence. Antibiotics – Use of an antibiotic ointment over a newly sealed wound may prevent any possible future infections. Debridement – Removal of any dead or damaged tissue from the surgical wound. Doing so creates a better seal for a new surgical closing. It can also improve the development of healthy skin tissue. If a wound has previously suffered a dehiscence, it must be monitored closely. Careful observation minimizes any issues that may occur during this second healing process. Although there are many reasons that contribute to wound dehiscence, what follows are the most common. When it comes to suturing, knots are much more than tying off the ends of materials passed through body tissues. Maintaining appropriate tension on the suture is vital to healing, so knots have to be set properly to ensure stitches remain intact. The knotting technique used depends mainly on the nature of suturing material. For example, multifilament materials are those that are made by braiding or twisting so that the coefficient of friction rate is high. As a result, knots hold well and remain tied as they are created. Monofilament materials consist of only one strand of fiber, and their coefficient of friction rates are much lower meaning that they tend to come untied more easily. Also, synthetic polymeric monofilament suture materials have “memory” which means they tend to return to their original shape instead of lying flat, which is a desired quality in suturing. The quality of suture knots is also a product of the skill of the person applying them. The positioning of knots is determined by the suture technique and wound being treated. These decisions determine how secure the knot remains. Using the wrong knots or tying them too hastily compromises knot quality. Proper suture knots are vital to the overall suturing process to ensure that wounds heal effectively. Improper suture knotting techniques can cause the knots to loosen or come undone entirely. This, in turn, relieves the holding tension of the suture, allowing the wound to open. An open wound will not heal correctly, causing infection or excessive scarring. Incorrect knotting techniques can also leave too much material remaining which not only becomes a snag hazard but can produce more significant irritation and discomfort to the patient. Knowing which suturing knot technique is appropriate is essential since the primary focus of wound suturing is to create closure for the wound. When suturing is done correctly, it reduces bacterial entry, heals properly, and produces the least scarring possible. If suture knots are applied too loosely, they can allow the suture to slip and lose tension. Loose knots snag easily during daily activities which can cause the stitch to break, increasing the possibility of the wound opening. If a suture is not held under its ideal tension by a correctly tied knot, the healing properties of the wound will be compromised. This can lead to improper healing, and bacteria may enter the wound creating infection, excessive scarring, and greater discomfort. 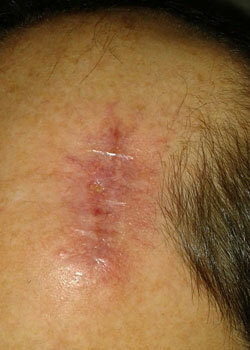 Sutures and knots can become loose even when they have been applied properly. The objective is to repair the suture before any lasting damage occurs to the wound. Suture tension must be regained to keep the wound closed, allow for full healing, resist infection, and minimize discomfort and scarring. Heavier suture materials provide the best tension strength for holding wounds closed, and require fewer and more secure knots. Lighter materials cause less tissue irritation and damage and glide through wounds more efficiently. But they need several knots for adequate closure. Thin suture materials, therefore, are selected for cosmetic areas, such as the face, to produce less scarring. If a thick suture material is used on the face, more noticeable wound and suture track scars are the results. Also, using absorbable versus non-absorbable or braided versus non-braided suturing materials incorrectly can lead to problems. Absorbable materials dissipate over time and do not require removal. Such materials can be somewhat unpredictable in their breakdown which, if used on surface wounds, can occur early leaving them prone to opening or tearing. The choice between using braided or non-braided sutures is just as important. Braided materials are woven together and provide better knots and wound tension, but are also considered causes of more adverse skin reaction. Additional, they can present a higher risk for infection due to the presence of grooves where germs can enter the wound. One of several types of needles can be selected for the suturing process. Two primary ones are cutting needles and round body needles. Cutting Needles – Cutting needles have two sharpened point edges that oppose one another. This design is for use on dermal tissue that is tough and difficult to penetrate, such as dense, thick and irregular connective tissue. Variations include conventional cutting needles and reverse cutting needles. Traditional cutting needles have a three-blade, triangular-shaped tip that is sharpened on the inner convex for better penetration and a flattened body which is more easily grasped by a needle holder. Reverse cutting needles have sharpened edges on the outer convex and are used to suture extremely tough yet delicate dermal tissue such as oral mucosa and tendon sheath. Round Body Needles – These suture needles have a tapered, sharpened tip and a round body designed to pierce instead of cut skin tissue. The grasping end is rectangular or oval for better holder control. Round body needles are used in soft, easily penetrable tissue, such as subcutaneous layers, abdominal viscera, peritoneum, myocardium tissue, etc. Cutting needles cause less injury to tough types of tissue because it will penetrate the tissue with minimal force as opposed round body needles where excessive force is needed to penetrate the tissue – but it may actually cause more damage in softer tissue like fascia – by tearing through the tissue causing damage and scarring. When this happens, it may indirectly increase the risk of infection. Some bodily structures are quite thin and friable, so always remember a cutting needle can cut through the tissue like a scalpel. Consider using a reverse cutting needle in certain situations. The importance of not suturing wounds under tension is emphasized in most surgical skills and suturing courses. Excessive pressure may cause the suture to break and could cut tissue which leads to the wound opening. Practice in avoiding too much tension leads to the successful use of finer gauge materials. The following case study illustrates what happens when sutures are overtight. 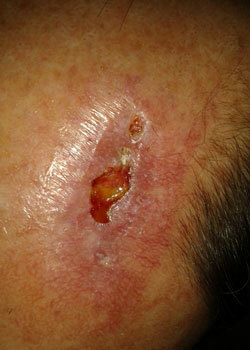 A 56-year old Caucasian male presented with a recurrent basal cell carcinoma of his scalp. The lesion was incompletely removed by a general practitioner six years previously, and subsequently excised by a dermatologist twice – but recurred again. Although basal cell carcinoma may be considered a very “innocent type of cancer” because it rarely metastasizes, it is notorious for recurring locally. The patient was then referred to a plastic and reconstructive surgeon who booked the patient for a more radical excision of the 10 x 12 mm lesion. A couple of days later the lesion was removed under sedation in O.T with about 1 cm clean margins making the defect about 2 x 3 cm. The adjacent tissue was undermined for a reasonable distance and closed primarily with 3-0 monofilament resorbable suture material. On inspection, the wound started to open up and dehisced quite severely. It was decided to allow the wound to granulate and thus heal by secondary intention. Complications are unpleasant to anyone involved in this kind of a situation, but specifically so to the practitioner and the patient. However, as you may notice, it is not always a train smash. In this case, the wound eventually healed rather nicely with an acceptable aesthetic result. In the imagines, you will note that the red color marking the dehisced wound fades almost entirely in time as the final stages of wound healing occur and scar maturation progresses. A free skin graft – In my opinion, this would have given a much worse aesthetic outcome. But if the defect was anything more substantial, the surgeon may have had to use this option. Should this procedure be selected, the donor site should be kept in mind since it becomes a secondary surgical site with all the possibilities of complications developing. A local pedicled scalp flap – This may have been a better choice because the defect margins could be increased. This option minimizes the tension on the wound margin since it “spreads” the wound defect more evenly over a larger area. 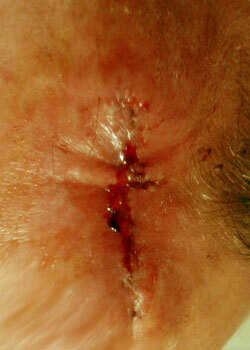 Alternative suture materials and techniques – The surgeon could have undermined the wound edges even more and then used a deep layer of resorbable and non-resorbable sutures on the surface for the final closure. This choice gives the surgeon control over the length of time to keep the suture in place. Vertical and/or horizontal mattress suture may have been a better suturing method to use as it would have added a bit more “hold” to the wound closure. Retrospective wisdom is valuable because it allows for evaluation of choices made – what worked, what didn’t, and what could have been done differently. In my opinion, the surgeon achieved an acceptable and reasonable functional and cosmetic result. Three goals comprise proper wound management. Provide for a favorable environment for hemostasis. Arrive at a scar that is aesthetically acceptable. Infection is a crucial consideration when treating wounds, and all wounds are considered to be contaminated since underlying tissues have been exposed to outside conditions that generally thrive with bacteria. Sutures should not be applied to infected wounds. Suturing wounds is about closing the dead space between severed tissue walls so that they can undergo the natural process of hemostasis. If infected wounds are sutured, or wounds are sutured without being thoroughly cleaned and debrided, an infection will grow and spread, compromising the healing process. Therefore, any infection must be effectively treated before the sutures are applied. 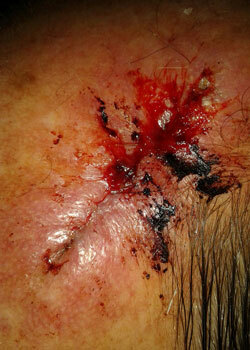 The most common cause of wound dehiscence is placing sutures very close to the wound edges. Experimental studies show that the more distance there is between the lips of a wound and the suture, the lesser the chances of wound dehiscence. This is because the lip or edge area of the wound displays inflammatory changes, swelling, increased blood supply and reduced collagen structure. The introduction of collagen fibers during the healing phase also puts pressure on the surrounding area, thereby increasing wound tension. Finally, necrotic tissue and aponeurotic tissue zones within the area can also affect suture hold. If the wrong suture technique is used, it can create wound complications such as infection, improper healing, circulation issues, or puffy, broad, or dark scars. Suture breakage is one of the most common problems when improper suture techniques are used. Breaks in sutures can occur due to inappropriate materials, irregular application angles, improper suture material or suture size, and excessive suture tension. There are eight basic suturing techniques. Far-near near-far modification of vertical mattress suture, creating pulley effect. Half-buried horizontal suture (tip stitch, three-point corner stitch). Improper suture techniques can also lead to infection by allowing bacteria to enter the wound. Infection can compromise the healing process and even require that the wound be reopened for cleaning. For a wound to heal properly, it must be assessed and treated correctly. This involves proper cleaning, debridement, and suturing of the wound. Part of the healing process includes applied sutures being removed at the right time which can vary depending on the stress placed on the wound and where it is located. Although the specific situation determines when sutures are removed, they are customarily taken out between 5 to 14 days. If sutures are removed too soon or are allowed to remain too long, complications may arise. Sutures are applied to close a wound to keep bacteria out and to allow tissue colligation. If sutures are removed prematurely before underlying tissues have bonded sufficiently, then the wound could reopen (dehisce), damaging newly colligated tissue and allowing bacteria to enter. Deep wounds are particularly vulnerable to dehiscence if they do not have adequate absorbable sutures buried in the underlying tissues providing more tensile strength to hold the wound together. There are several problems which can arise from sutures being left in too long. First of all, because sutures are looped around wound edges, scar tissue can begin to form around them if they are left in too long. Also, scarring of the wound closure as well as “railroad tracks” from the sutures themselves can be excessive if the sutures remain past the prime removal time. This can be quite problematic if the laceration is in a sensitive area such as the face – therefore, in most cases, facial sutures are removed no longer than five days post-operatively. 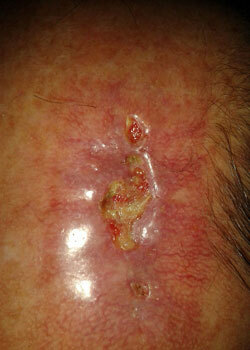 The risk for keloid scar formation is also increased when sutures are allowed to remain for too long a period. Keloid scars consist of firm tissue that is much larger than that which forms normal scar tissue and are common occurrences in wounds of the chest, waist, shoulders, elbows, arms, and ears. African Americans and those having a history of keloid scarring must have their wounds monitored closely so that sutures can be removed promptly to reduce keloid formation. 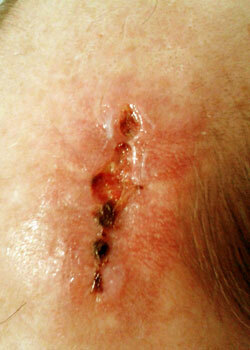 The risk of keloid formation is also higher if the wound dehisces due to premature removal of sutures. It is difficult to be precise on timing, which is why diligently watching the healing process is vital if keloid formation is to be avoided. Any wound should be thoroughly cleaned and, if necessary, debrided to remove all foreign material from it. Foreign objects may include wood or metal splinters, glass shards, bone fragments, thorns, gravel, hair, cloth fibers, etc. If external items are not detected during the initial assessment, and the wound is closed, they can present problems such as bleeding, inflammation, infection, and excessive pain. It is far better to remove all foreign materials during the initial assessment and before closing the wound because objects are more visible. Once a wound is closed with foreign material sutured inside, problems such as inflammation, granulation, infection, and scarring may occur. Persistent draining of an inflammatory exudate or pus. If signs of remaining foreign objects occur after a wound has been sutured closed, the clinician may opt to use special investigations like X-rays, MRIs and CT scans to assess for the presence of foreign material remaining in the wound. The longer the object remains in the body, the more it incorporates ingrowth of tissue. An abscess can form, and fistulas may develop between organs. The foreign body reaction may be immediate or may be delayed for years. Diagnosis is sometimes difficult and costly, and removal of the object usually requires major surgery. Retained sponges can be removed through laparoscopic surgery if they are discovered before adhesions develop. Once a foreign body is detected, a determination is made if it should be removed at all. If more damage will occur by removing it, the decision may be to leave it in. Other times foreign objects can be removed rather easily. In other cases, the body may dissolve, absorb or expel them naturally over time. A 45-year old male presented with vegetative material extruding from a laceration at the superior orbital rim. He had sustained a mechanical fall into a bush three months before presentation. He arrived at an outside ED, where the laceration was repaired. His exam revealed a well-healed periorbital laceration and 20/20 vision on the Snellen chart. A CT scan showed a linear foreign body with its proximal end in the medial orbit. This object traversed the medial orbital wall, ethmoid sinus, and sphenoid sinus. A dehiscence of the posterior sphenoid sinus wall was noted adjacent to the posterior edge of the foreign body. A CT-A confirmed that there was no apparent injury to the carotid artery. Due to the risk of vascular injury, the procedure was performed in the IR suite. Given the proximity of the foreign body to the carotid artery, an angiogram and balloon occlusion test were completed before the attempted removal and a sheath was kept in place. A combined endoscopic and open approach was performed by the ophthalmology and otolaryngology services department. A septoplasty with posterior septectomy, left total ethmoidectomy and bilateral sphenoidotomy was required to expose the object. Following this, the team was able to see a stick entering the ethmoid sinus at the lamina paprycea and extending to the right lateral sphenoid sinus. Next, a periorbital incision was made, and dissection was performed along the medial orbital wall until the stick was encountered. The object was then able to be removed by grasping its proximal end in the orbit and pulling it out. The patient had no neurological deficits postoperatively and was discharged the following day. Uncommon hereditary coagulation disorders can lead to wound dehiscence. In the first month after transplantation, most infections are caused by the same hospital-acquired bacteria and fungi that infect other surgical patients (e.g., Pseudomonas sp causing pneumonia, gram-positive bacteria causing wound infections). The most significant concern with early infection is that organisms can infect a graft or its vascular supply at suture sites, causing mycotic aneurysms or dehiscence. When arterial bleeds exert immense pressure inside the wound, it opens. Bleeders are controlled either by ligation (typing bleeding vessels off), or diathermy (burning them closed with an electric current). One of the attributes of a cancerous growth is the loss of cellular adhesion. Sutures placed in a malignant tumor prevent healing. Avoid unnecessary stress or strain to wound area such as heavy lifting, exercise, vomiting, coughing, or constipation. Brace the body with a hand or a pillow at the wound site to relieve stress to the wound when doing an activity. Comply with the doctor’s post-operative instructions and prescribed medication. Employ wound care, dressing, cleaning and hygiene as prescribed by the doctor. Maintain good hydration and a healthy diet which can lead to faster healing and prevention of constipation. A normal healing process after surgery can be divided into three stages. Lasts one to six days. There may be redness and swelling. The wound may feel warm and slightly painful to the touch. Lasts four days to a month. A scar begins to form. Edges will pull together and there may be some thickening. There may also be some red bumps inside the wound site. Lasts six months to two years, depending upon the type of surgery. Wound fills in and a new surface is present. Scarring becomes thinner, flatter, and whiter. Any deviations from this healing process, particularly between five to ten days postoperatively, could indicate possible dehiscence. Most dehiscences occur four to fourteen days after surgery. Contact your healthcare professional if there are any concerns about the healing progression. Left untreated, wound dehiscence can lead to more serious or life-threatening conditions. By understanding the healing process and being attentive to it, you’ll recognize if it’s falling outside typical parameters. Then you can get in touch with your healthcare provider for early intervention. Through this simple, proactive measure, you may avoid dehiscence and contribute to an optimal healing outcome. Is it possible to have wound dehiscence internally only? Externally the incision is intact except an area of a scab that’s still healing. I went through a major surgery on my back to reattach muscles to my scapula. I had 22 staples. 2 days post op I vomited violently and felt terrible pain in the inferior area of the incision. I happened to be at the dr’s office and he assured me it was just post op pain. I continued having pain here with every movement. After 4 weeks in a bolster sling, I was told to discontinue wearing it. At that time I literally felt like someone was unzipping my scapula off of my back. It swelled and discolored. No signs of infection…oozing or fever but I couldn’t stand for it to be touched in that area(still can hardly stand it actually at 18weeks post op). I have had my pain management dr, my pcp and my surgeon look at it but they reassure me the incision looks fine. It doesn’t feel fine though. I know looks can be deceiving. To complicate things….I am a lupus patient and try to reiterate to them that I heal very slowly and differently than other people. Please help if you can offer any advice. I have lots of pics of this area along my course of healing….something just doesn’t seem/feel right. Thank you for your time. The short answer is – yes – one can get wound dehiscence in the internal layers with or without surface dehiscence – especially with muscle that moves and contracts all the time! Trust it helps – and best with your shoulder! P.S. A MRI scan will show if it is fine…or not. Thank you for the reassurance. Although, I’m sure we will never know if I have had it or not because my MRI that was just done showed fluid and possible retear but I’m being told this is normal to be seen post operatively…..18weeks seems like pretty far out to still have fluid and be in this much pain but obviously I’m not the experts. Just know my body pretty well and somethings not “sitting right” in my gut. I know what you mean by trust but who do I trust….my drs or my gut. At this point I guess it doesn’t really matter. But thank you for the response and well wishes! Interesting article. I’m wondering about dehiscence in a very old wound – 22 years ago, I received 3-4 stitches to close a cut on the tip of my thumb. 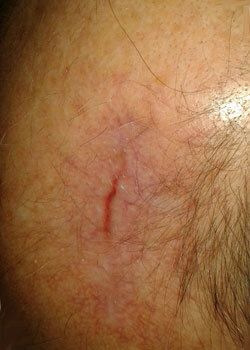 It appeared to heal nicely, but in recent years when the weather is cold and dry, skin splits at my scar. Sometimes it splits enough to ooze a little blood and throb a bit. It always heals again when the weather improves and I moisturize the area. Is there a way I can get this wound to heal permanently? The short answer is- not really – it is a case of do it first time properly! Recently had ankle surgery requiring an incision on top of the ankle. At 2 week appointment, doctor decided to leave stitches in for another week as there was an area of ‘concern’ in the incision. The stitches were removed a week later and the area of concern opened up. Although I have limited my activity and weight bearing the incision has now opened to half its original length and we’re treating with Silver Sulfadiazine, twice a day with re-wrap, vitamin C, a multi-vitamin and antibiotics for good measure. The wound looks no better or worse and in it’s location I’m wondering how it can ever close. Any ideas?